I love games that require very little preparation and materials but really focus on important math concepts and skills. Here is one that will allow students to identify different coins and understand their value. In addition they are developing an understanding of equal groups and unitizing along with the skill of skip counting. Parents can easily play this with their children at home. Player 2 does the same. Continue taking turns. When a player gets 5 pennies they can be traded in for a nickel. When a player gets 2 nickels they can be traded in for a dime. When a player gets 2 dimes and a nickel they can be traded in for a quarter. I adapt this game for younger children new to money by just using pennies and either nickels or dimes. You can rename this to Race for a Nickel (Or Five Nickels), or Race for a Dime (Or Two Dimes) etc. 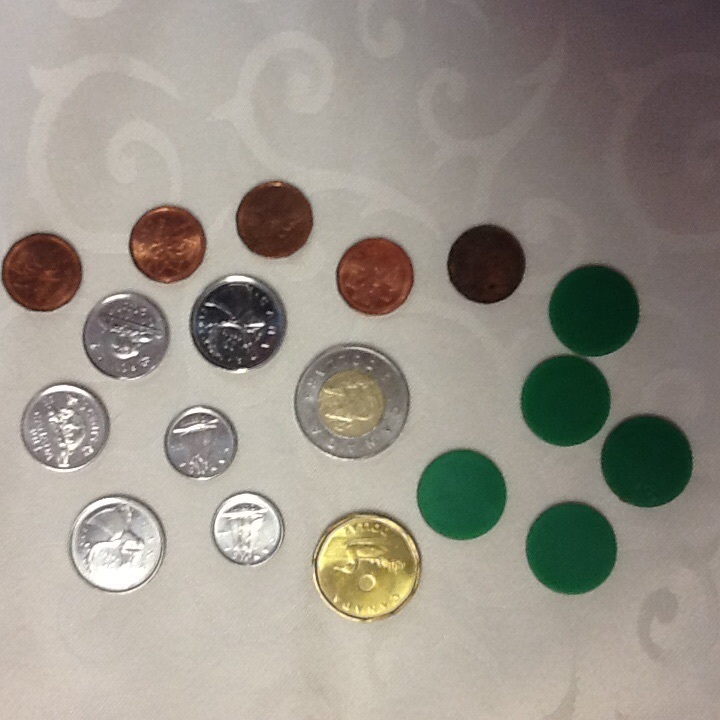 Five and Ten Frames could be used to organize the pennies. At another time you might eliminate the dime and race to a quarter using only nickels. As you can see this is a very adaptable game, but once again low prep and high yield! I adapt this for other students by using 2 number cubes and many more coins. They do not have to start by using pennies but can take whatever coins they can to make up their roll and trade as necessary. This can be called Race For A Loonie (or Toonie). Note: I know that we no longer use the penny in real-life, but it is the basis of our money system. I feel that it is important to use it when students are developing their understanding of the value of the coins. I do tell them that they will not be seeing this coin as it is no longer used. Otherwise, it is very difficult for them to understand why one coin such as a nickel is worth 5 of something. If you do not have pennies then I would suggest using same coloured round counters to replace them. Can they name the coins? Can they skip count with the same coins? Can they count with a mixed set of coins? How do they approach counting a group of mixed coins? Give this game a try and let me know how it goes. Feel free to adapt to your own situation. Have fun at school and at home!